Alex has an unashamedly avowed to be the best female footballer in the world and has just moved from Florida to France in pursuit of that ambition. 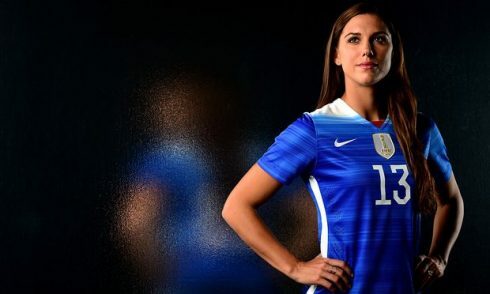 Morgan’s drive might be matched by Lyon but the 27-year-old World Cup winner and Olympic gold medallist, who has scored 73 goals in 120 games for the USA, stresses how many more important battles are still to be won for women’s football. “It’s great to see women standing up in their own line of work and fighting for fair value,” she says after name-checking Jennifer Lawrence and Taylor Swift. Such starry allies suit Morgan, who has more than 2.8 million followers on Twitter, but there is also a wearying grittiness to the struggle for equality in women’s sport. “We’re trying to do the same thing and we’ve come a long way. But it gets exhausting having to do this every day, every week. Our male counterparts have not had to fight as much – so sometimes you feel a little exhausted always having to prove yourself and show your worth.” Read more. If you are a coach or trainer with an interest in women’s personal development, please do check out our licensing opportunity.